Watch the video below to learn more about the Seagrove, North Carolina, pottery tradition and how the Owen family history fits in. Ben talks about learning the craft from his family, studying at college and abroad to deepen his understanding of the history of ceramics, and returning to his North Carolina roots to set up Ben Owen Pottery on the same land where his grandfather once worked. Click on the arrow in the center of the image above to watch video. Photo by Mildred Allen. Ben Owen III is a potter from Seagrove, North Carolina. His forefathers came to North Carolina (NC) from England as early as the late 1700s to make a new living in the USA. Some of these early generations learned skills in craft by making pottery and furnishing storage jars along with other utilitarian wares for early settlers. Ben’s grandfather, master potter Ben Owen, Sr., admired the early Asian pottery he saw displayed in museums and collections while working at Jugtown Pottery (1923-1959). He translated those works into his own style later at Ben Owen Pottery (1959-1972). Ben III studied pottery as a young apprentice first with his grandfather in the late 1970s-1980s and later at East Carolina University (1989-1993). Like his grandfather, Ben creates pottery that reflects a foundation in traditional early american designs, and incorporates influences from Asia, Europe, and Persia. Ben has participated in workshops and conferences throughout the United States, Japan, Australia, New Zealand, Europe and recently in China. His work can be found in many museums nationwide, including the Museum of Fine Arts, Boston, and the Smithsonian Museum of Art. Ben’s commissions grace the lobby of the Ritz Carlton Tokyo Hotel in Japan and The Umstead Hotel and Spa in NC. Singer/songwriter James Taylor and golfer Arnold Palmer are among the notables whose collections include works by Ben Owen III. EARLY SETTLEMENT | Several families, including Craven, Chriscoe, Cole, Luck, McNeill, Owen, and Teague, immigrated from Great Britain in the middle of the 18th century to central North Carolina, finding soil suitable for farming and clay suitable for continuing their European pottery traditions. They developed a local and regional market for everyday functional items used at home to store food and other goods, and in clinics for medication. The earliest piece of pottery in the Owen collection is a salt glaze preserve jar made by JJ Owen (1830-1905) five generations before Ben Owen III. It is believed to be made around 1870s. His son MW Owen (Manley) was also a potter working for other potteries as a journeyman. During the early 1900s the Industrial Revolution affected the demand for pottery items in the South. Glass and mass-produced ceramic containers from factories became available, leaving the small business traditional potter without a strong market. Even so, a few Seagrove/Westmoore area potters continued making functional pottery during this time, including Rufus Owen, Ben Owen III’s great-grandfather, and James H. Owen brother to Rufus. When Ben Owen Sr. was a young boy, he would help his father, Rufus Owen, along with his two brothers Joe and Charlie Owen. They would have jobs of preparing the clay by picking out roots and rocks or handing pottery into the groundhog kiln. All three boys would try their hand at the potters wheel when they had a chance. The most common type of kiln used by the early settlers was called a groundhog kiln. Its roots are German and English (Cassel and New Castle Kilns). This kiln was a tunnel about 13 to 20 feet long. The firebox was at one end and the pottery sat elevated behind. Temperatures would reach from 1800 to 2400 degrees Fahrenheit. The groundhog was mostly used for stoneware but at first was used in production of earthenware dishes and storage containers. JUGTOWN POTTERY ERA | Jugtown Pottery, near Seagrove in the center of North Carolina, was founded in 1917 by Jacques and Juliana Royster Busbee, artists and art enthusiasts from the state capital city of Raleigh. After discovering an orange pie dish made of clay at a county fair in NC, they traced the pie dishes’ origin to Moore County and found other orange and earthenware style pottery and salt glazed wares being made by the local potters. Salt glaze wares were produced by adding salt to the kiln near the end of the firing at or near the maturing temperature of the clay. At times pots were embellished with blue or simple incising and almost entirely utilitarian. With Prohibition in 1907 and the beginning of industrial methods of vessels for containment, the potters began to find other means to support their families than pottery making alone. The Busbees saw an opportunity to revive a then-dwindling craft. Juliana started a tea room called the Village Store in 1918 in Manhattan in order to market the pots to New Yorkers. The first orders for pots for the Village Store at 60 Washington Square in Greenwich Village were given to four Seagrove area potters with their own wheels and kilns: Henry Chrisco, Rufus Owen, James H. Owen and J.W. Teague. These potters made the utilitarian pieces that had served local needs for generations. The Busbees soon found that they wanted to go beyond the area’s utilitarian shapes and glazes. J.H. Owen was born in 1866, the son of Benjamin Franklin Owen, father to M.L. Owens, grandfather to Vernon Owens, great grandfather to Travis Owens, brother to Rufus Owen and uncle to Ben Owen Sr.. M.L. Owens (who added the s to his surname) recalled in an interview that J.H. Owen learned to turn under Pascal Marble, whose shop was south of Seagrove. In 1910, J.H. set up his pottery on the site which is now the Owens Pottery, owned by grandson, Boyd Owens. By 1917 he was making pots for Jacques Busbee. He turned, decorated and fired these pots at his workshop, as the Jugtown shop was not yet built. Purchased by the Busbees, the pots were then sent to the Busbees’ tea room in Manhattan. J.H. Owen also made pots for his own shop. Many examples of these early orange and salt glaze with cobalt pieces have been found in the northeastern states. Some pieces bear the J.H. Owen stamp, and a few bear the Jugtown stamp. At the time that the Jugtown stamp was made in 1922 or early 1923, J.H. Owen began stamping his personal wares with his own stamp. Quite possibly the Jugtown stamp and the J.H. Owen stamp were made at the same company together. The two stamps are similar in style. This would also explain why fewer stamped pieces by J.H. Owen have been found. J. H. Owen died in 1923. Charlie Teague was born in 1901, the son of potter John Wesley Teague. He learned to turn in his father’s shop. He was the first potter hired by the Busbees to work at the newly built Jugtown Pottery when he was twenty years old. Charlie was a skilled hand at turning and because he, like J.H. Owen, predated the Jugtown stamp, many of his first unmarked pots were sold through the Busbees’ tea room. Charlie and his wife Annie lived with Jacques Busbee for several years, while Juliana ran the New York shop. Annie did the cooking and housework while Charlie made pots. Their son, Garrett, was born during this time and remembers Jacques Busbee fondly. Charlie worked at Jugtown Pottery until 1931 or 1932 according to the recollection of Annie Teague. He died of pneumonia in 1938 at the young age of 37. Knowledge of Charlie’s and J.H’s pots remained unknown until the 1980s. Teague’s style is becoming more recognized as different from that of Ben Owen or J.H. Owen. Ben Owen Sr. was hired in 1923 as the second known potter to work at the newly built Jugtown Pottery. He was born in 1904, son of potter Rufus Owen. Ben also learned to turn in his father’s shop. He joined Charlie Teague at the pottery and they worked together for ten years. Around 1932, Ben became the sole potter at Jugtown. A willing and skilled young turner, Ben produced masterful pottery for over thirty-six years, experimenting with many extraordinary forms under the guidance of the Busbees. He traveled with the Busbees to museums and socials, researching different styles of pottery from around the world. Many sketches and photos were taken to use for further study. He would return to the pottery near Seagrove filled with new inspirations. 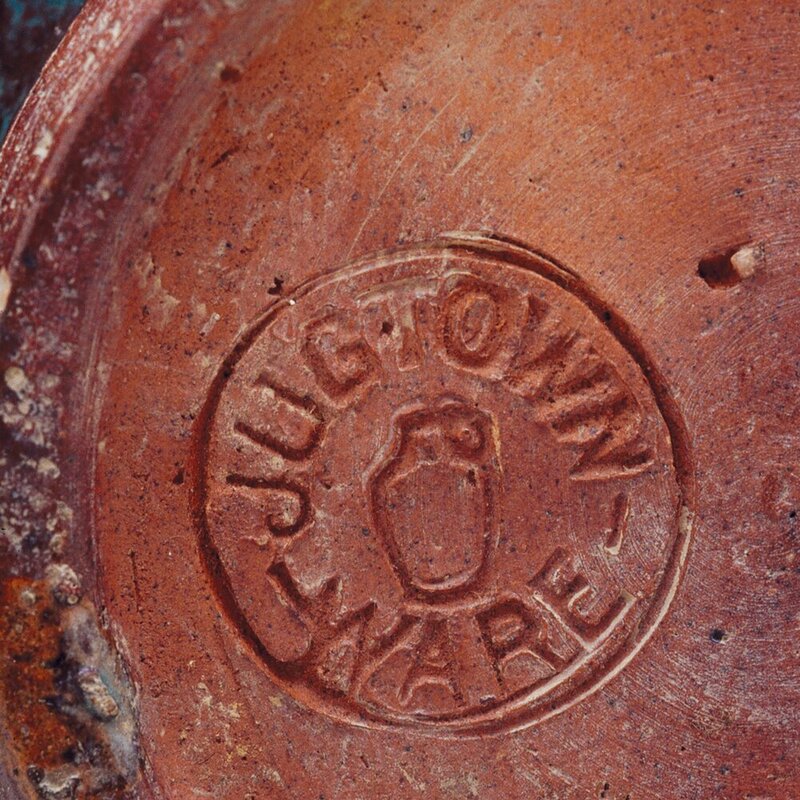 The Asian and Middle-Eastern influences of pottery played a key role in the foundation of a Jugtown style. OLD PLANK ROAD POTTERY In 1959, Ben Owen Sr. decided to spend the last part of his career in clay by establishing his own pottery called the Old Plank Road Pottery beside his home in Westmoore that is 7 miles from Seagrove. He continued the “new” tradition of making shapes and colors inspired from research encouraged by the Busbees early on at Jugtown. Some glazes that were used at Jugtown like Chinese Blue had not been made after the death of Jacques Busbee in 1948. From different accounts and research, the recipe for the glaze was lost. When Ben Owen Sr. began working on his own, he began recreating this glaze through his own experimentation. The results were similar but with a unique style. Ben Owen Pottery is located on the land where Ben's grandfather opened Old Plank Road Pottery in 1959. During the first year of operation, all work was stamped Pottery by Ben Owen. In 1960 a round stamp, Ben Owen Master Potter, was made for Ben Owen to mark his work made at the Plank Road Pottery. He was recognized as a Master Potter in 1928 during the Dogwood Festival for best of show with a White Dogwood Vase that was entered into the craft exhibit. The Old Plank Road Pottery continued to operate with son Ben (Wade) Owen Jr. making some pots and assisting with the glazing and firing of the groundhog kiln. Another talented potter, Farrell Craven—who descended from the first pottery family to settle in the area—was hired to make some of the functional items for the pottery in the late 1960s. Over time, rheumatoid arthritis kept Ben Sr. from producing many pots. His health caused him to retire from clay work in 1972. Farrell Craven passed away in the same year. The hands which had magically brought to life thousands of beautiful clay creations had come to rest. In 1977, Ben Owen Sr. began taking his grandson, Ben Owen III, to the pottery to have some fun working with the clay. After slaking the clay with water and teaching young Ben how to condition the clay, the wheel that had been sitting idle for several years began to spin again. A daily routine developed with young Ben coming by after school to spend time with the elder master over the next several years. Many of Ben Owen III's early throwing skills were developed through those afternoon and weekend sessions in the pottery studio with his Granddad. In 1981, Ben (Wade) Owen Jr. decided to work on some remaining pottery of his fathers’ along with the new creations by young Ben. The wood kilns were repaired and new batches of glazes were made to finish the wares. The Pottery was reopened for a special sale and most all of the pottery that was successful in the firings was sold out. Ben Owen III began making more work when time allowed after school and a young potter, David Garner, was hired to make pottery for the retail store. The history of potters marks, stamps, and signatures on the pottery can be seen below. POTTER’S MARKS | The stamp at far left that was used at Jugtown from 1923 through 1959. The potters who made work at Jugtown with this stamp were JH Owen (1923), Charlie Teague (1923–1931), and Ben Owen (1923—1959). A similar stamp was created and used after 1960 but was later changed to be a little different in size and style. There were a couple of different stamps used by Ben Owen Sr. in 1959 when he opened the Old Plank Road Pottery (Ben Owen Pottery). The second stamp from the left simply reads “Pottery by Ben Owen.” There are very few pieces found with this stamp, as it was only used for a few months. The second stamp from the right is another stamp used for a short period of time, a round stamp that read Ben Owen Master Potter. At right is the Master Potter stamp used by Ben Owen Sr. from 1960 to 1972. The pieces made by Farrell Craven in the late 1960s were also stamped Ben Owen Master Potter. In 1984, Ben Owen Jr. decided to use a stamp for all work that he or David made. The stamp was a straight line stamp. Another was also used by the two potters: Ben Owen Pottery. Ben Owen III used a stamp for a short time during 1984 that was simply Ben Owen III. Ben III went back to hand signing his name from that point until the year 2000. In the year 2000, Ben Owen III continued to hand sign his pots with Ben Owen III but also added a special stamp for 2000. It was a circular stamp with Ben Owen Pottery around the circle and 2000 in the center. Click here for a detailed biography of master North Carolina potter Ben Owen III (born 1968). Click here for a detailed resume of master North Carolina potter Ben Owen III (born 1968).